Copywriter | Portfolio | Intranets . 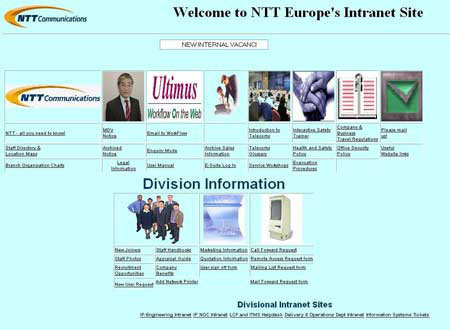 I designed, edited and managed the NTT Europe Intranet, which was used by employees in the UK , France , Germany , Belgium and Italy , and contributed to the English-language portion of NTT Communications' Intranet. Both had, unlike public Internet sites, "captive" audiences who had a vested interest in reading, but everything I wrote and edited was designed to be informative, interesting and useful to its audience. Both sites were used as information resources by employees, so had to be absolutely up-to-date and accurate. I liaised with relevant Human Resources, Sales and Engineering staff to make sure of this.